According to a survey compiled by The Art Newspaper in April 2013 the Vatican Museums ranked fourth in the list of the most visited museums of the world with more than 5,000,000 visitors in 2012. 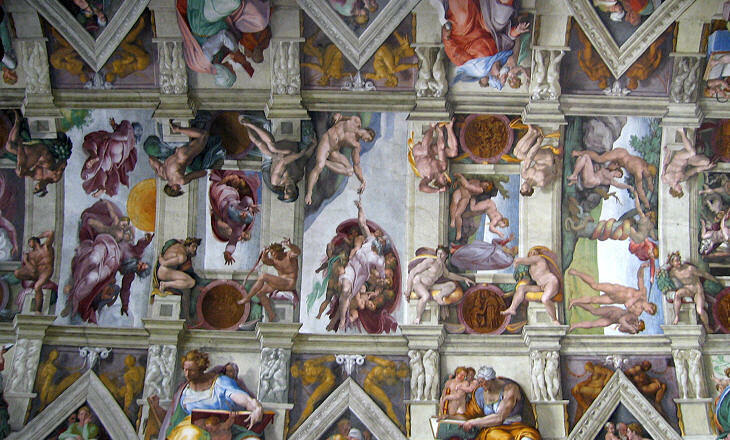 The buildings housing the Vatican Museums, with the main exception of the Gallery of Paintings, were not designed for being visited by a daily crowd which can exceed 20,000. Every day a long and packed procession goes through long "corridors" from the entrance near Casino del Belvedere to the rear side of Palazzo Apostolico to see the Borgia and Raphael Rooms and eventually the Sistine Chapel to admire the top "must-see", the ceiling painted by Michelangelo for Pope Julius II in 1512. First time visitors often pay little attention to the ceilings of the other rooms; they are not regarded as masterpieces and some of them are works of painters or decorators who have fallen into oblivion. Yet they make up an illustrated history book which provides information on the periods the rooms were built and shows the changes in art taste which occurred between the late XVth century (Casino di Belvedere, Borgia Rooms) and the early XIXth century (Museo Pio-Clementino, Braccio Nuovo) when the Vatican Museums acquired their current appearance. Because of the crowd it is not easy to properly observe the floors, but these too contributed to the overall decoration of the rooms and are a source of information. 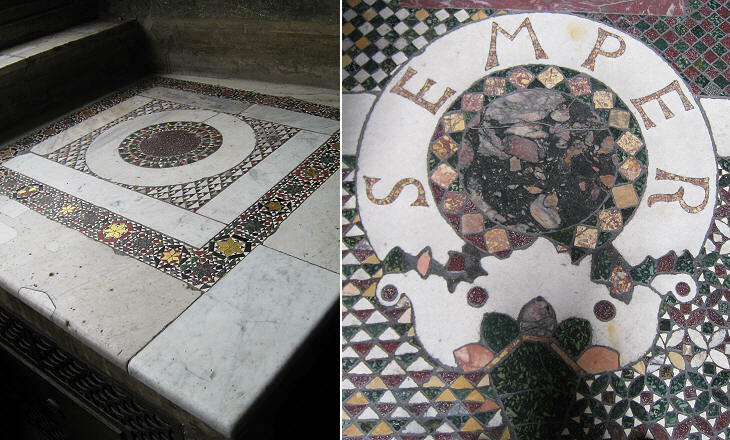 The floors of the Raphael Rooms show that while the walls were decorated with Renaissance masterpieces, some traditional medieval patterns were still in fashion. 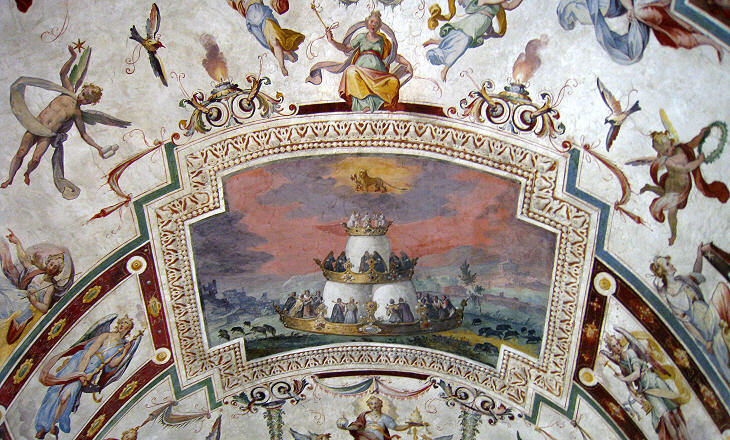 While the popes commissioned Raphael, Michelangelo and other famous painters the decoration of their apartments with frescoes which had a religious subject or illustrated great events of the history of the Church, Casino del Belvedere retained its characteristic of being a place where the popes lived in a more relaxed environment. The decoration of some rooms commissioned by Pope Julius III recalls that of his suburban villa. The portrayal of two putti or two angels at the sides of a papal coat of arms is very frequent, but naked young men such as those holding this coat of arms are rarely seen. Because the faces are identical it is likely the Pope asked the painter to portray his young lover, whom a satire by Pasquino described as garzoncello vago ed effeminato (beautiful and effeminate young man of poor birth). He was adopted by the Pope's brother and made a cardinal three months after the election of Pope Julius III in a specially held consistory (a formal meeting of the College of Cardinals during which the Pope creates new cardinals). The decision caused general outrage. especially after the Pope entrusted him with the running of State affairs. He was forced to revoke the appointment in the following year, because of the incompetency of the man. 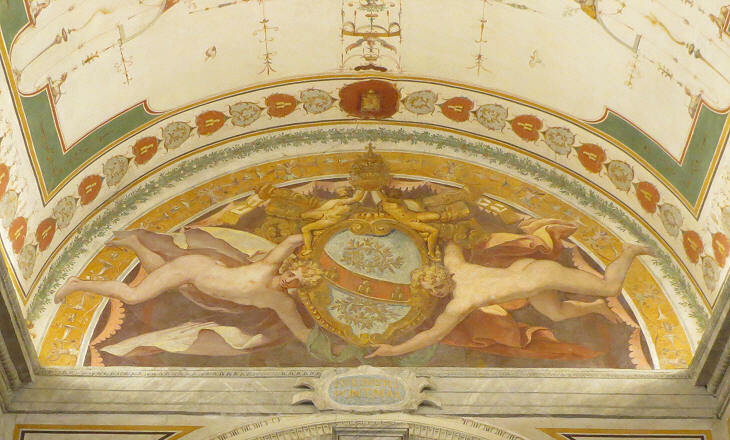 You may wish to see another coat of arms of Pope Julius III which is held up by two naked young men. 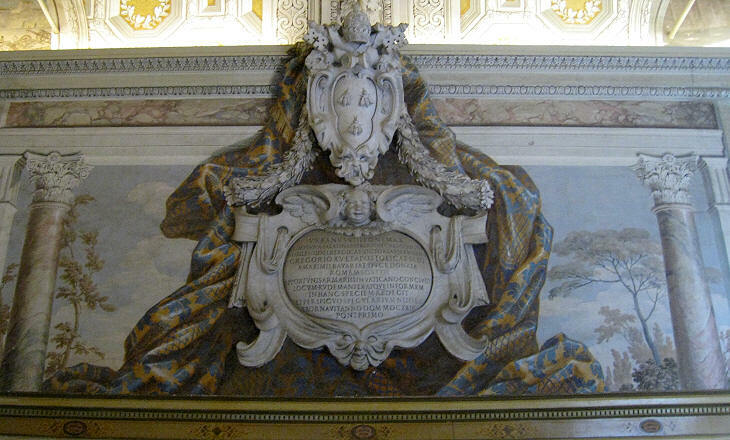 Pope Gregory XIII started the decoration of the long "corridors" which linked Palazzo Apostolico with Casino del Belvedere. He promoted astronomy and geography studies. He built Torre dei Venti, an astronomical observatory, above one of the "corridors". A section of the same "corridor" was devoted to the depiction of Italy in large frescoes on the walls showing detailed maps of its regions. 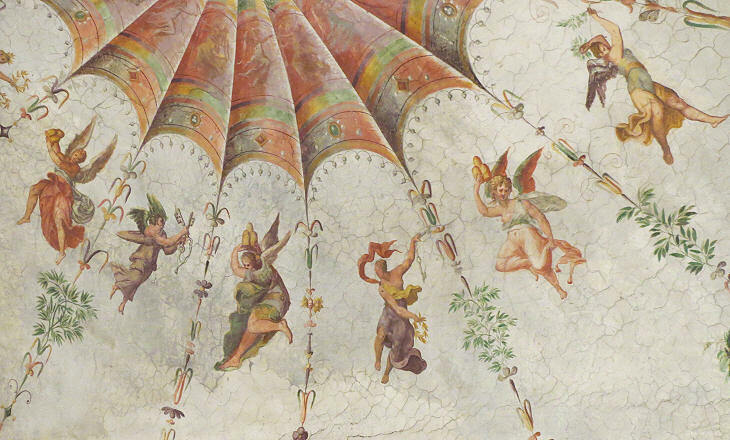 Smaller frescoes on the ceiling show miraculous events occurred in the corresponding region painted on the walls. They were framed by a very elaborate stucco decoration which includes many dragons, the heraldic symbol of the Pope. Pope Nicholas V is regarded as the founder of the Vatican Library. In 1587-89 Pope Sixtus V moved the location of the Library to the storey below the Gallery of Maps. Its rooms were decorated with some very interesting frescoes depicting the progress in the construction of the dome of S. Pietro and other initiatives taken by the Pope to embellish Rome. The ceilings have many references to the heraldic symbols of the Pope. They were a star, three mountains and a lion holding pears, so painters had many ways to show their ingenuity. 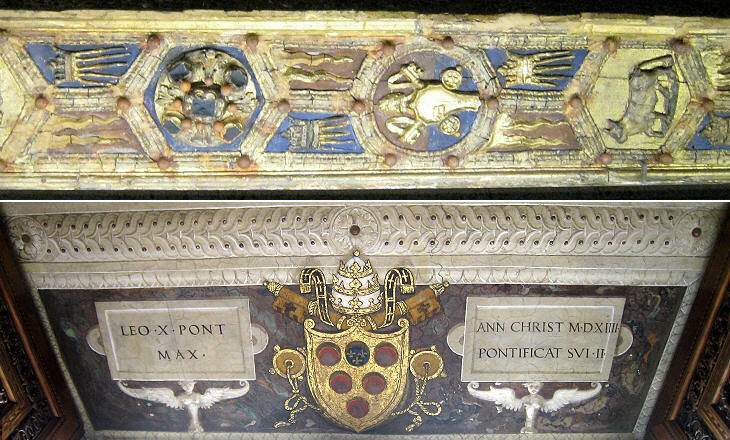 Pope Paul V enlarged the Vatican Library and had the new rooms decorated in a very similar manner as the first ones. In this fresco he has his nephew Cardinal Scipione Caffarelli Borghese at his left. 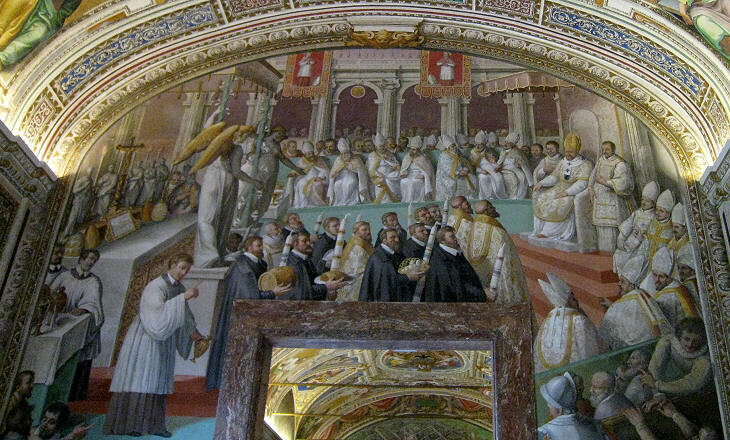 The fresco gives an idea of the pomp of the Papal court and reminds the viewer of the very active foreign policy of this Pope. In order to contain the Ottoman threat, he did not hesitate to establish relations with Shah Abbas, King of Persia and a fierce enemy of Sultan Ahmet I. 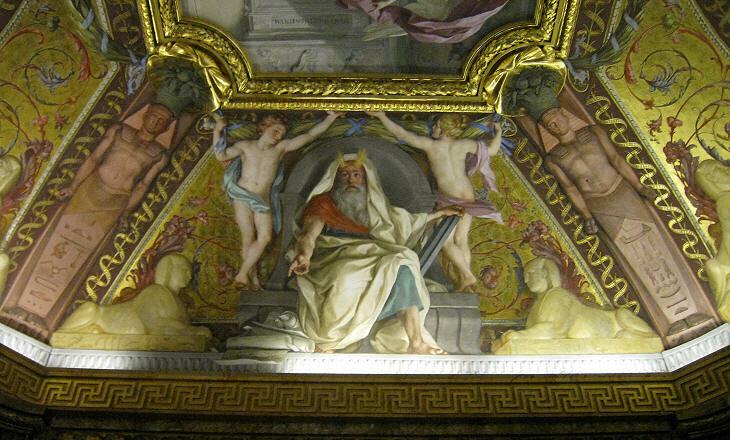 One of the rooms decorated by Pope Paul V is named after the fresco at the centre of the ceiling. The Pope and his nephew were avid collectors of ancient statues for their palace and suburban villa, but they were always careful not to suggest that they were fond of the pagan gods. The fresco needs to be interpreted in its astronomical significance. 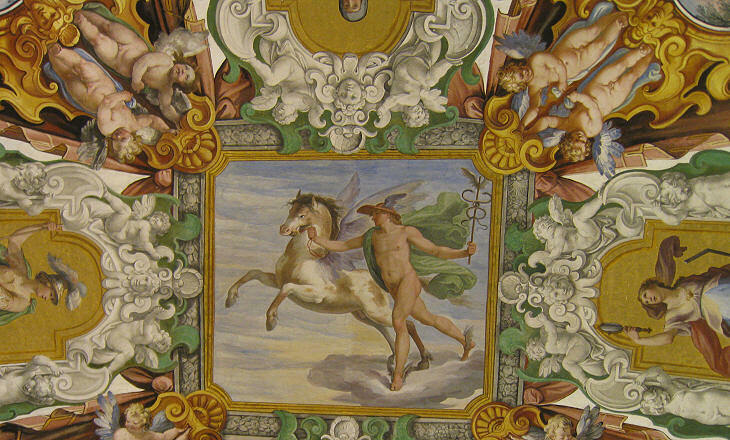 Mercury, the planet, and Pegasus, the constellation, were in conjunction when the Pope was born or when he was elected. E' del poeta il fin la la maraviglia .. chi non sa stupir vada a la striglia (The aim of the poet is to surprise .. he who cannot astonish us should work in the stables). Giovanni Battista Marino was the most famous Italian poet of the early XVIIth century and his views on the purpose of art were shared by painters and sculptors. The peak of this artistic trend was reached at the end of the century with the illusionistic ceilings of il Gesù, S. Ignazio and other Roman churches, but the desire to stupefy (and the ability to do it) can be observed also in this minor work of art. In the late XVIIIth century the Popes made modifications to Casino del Belvedere so that it could properly house their large collection of antiquities. 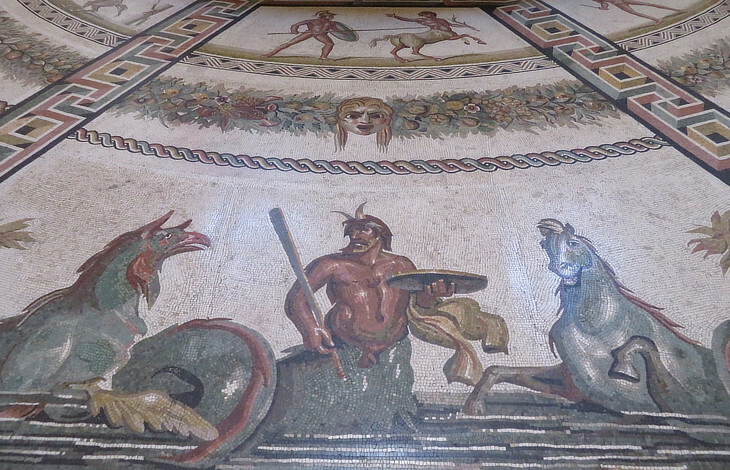 The floors of some of the rooms were decorated with large ancient mosaics found in that century. They were extensively restored. That of Otricoli required six years of work by Gioacchino Falcioni, an antiquarian, who added some sections in order to fit the size of the room. 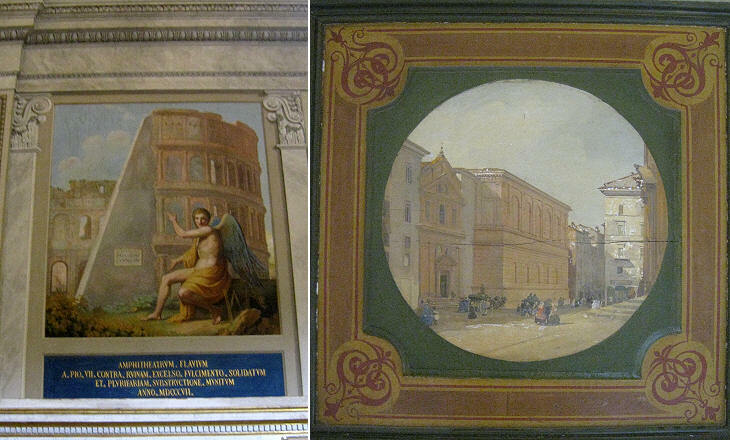 The ceilings of some of the new rooms were decorated with paintings which tried to combine a religious subject with the statues on display in the room. Today the decoration of the ceiling and the contents of a room do not always match. Several of the "Egyptian" statues in this particular room were actually Roman statues commissioned by Emperor Hadrian for his villa. In the XIXth century the limited resources the Popes could devote to the embellishment of Rome were absorbed by the reconstruction of S. Paolo fuori le mura after a devastating fire which occurred in 1823. This explains the modesty of some of the initiatives of Pope Pius IX which are celebrated by small paintings on cupboards he donated to the Vatican Library. 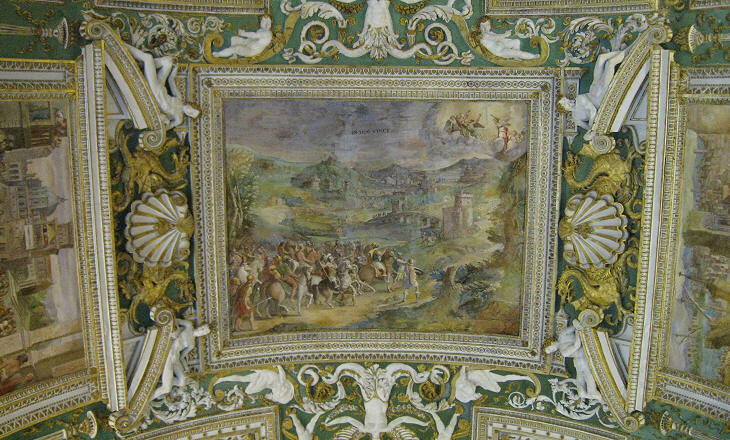 The image in the background of this page shows another detail of the ceiling commissioned by Pope Julius III at Casino di Belvedere.